The Anonymous movement has stressed that the march is peaceful and intended as a means "to meet and greet like-minded individuals." LONDON (Sputnik) — The fourth annual Million Mask March, organized by the Anonymous movement, is underway in London, a Sputnik correspondent reported Sunday. According to the mission statement of the march, the demonstration aims to "remind this country what it has forgotten: that fairness, justice and freedom are more than just words." 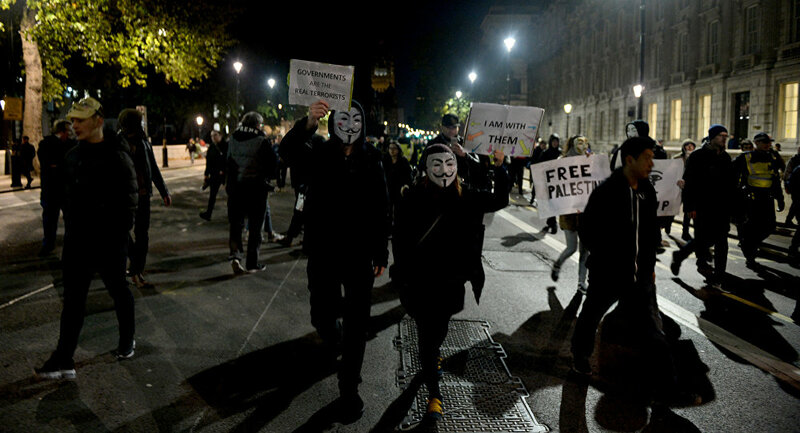 The rally began at around 18:00 GMT, with participants gathering at Trafalgar Square in the center of the city. Numerous police units and police patrols on horseback arrived at the site ahead of the demonstration start. Marchers moved toward Parliament square, accompanied by police. Protesters lit flares and chanted slogans, often explicit. According to a statement published by the organizers on a Facebook page, "all the activists, the workers, the students, all doctors, nurses and all those that want to see a positive change in the world" are invited to join the rally. Organizers stressed that masks and face coverings are optional. The movement also stressed that the march is intended to be peaceful "to meet and greet like-minded individuals," specifically pointing out that no violence will be tolerated, as well as avoiding the use of drugs or alcohol. A Scotland Yard representative told Sputnik that several hundred people were taking part in the demonstration, considerably less than in 2016. The spokesperson also added that the police asked protesters to finish the demonstration by 21:00 GMT. The Anonymous movement holds its march annually on November 5, Guy Fawkes Day, in commemoration of the events of 1605, when members of the Gunpowder Plot attempted to blow up the House of Lords. Thanks to the 2005 movie V for Vendetta, the mask of Guy Fawkes, one of the members of the plot, has become a symbol of resistance and anarchy, as well as that of the Anonymous movement itself.